What does it mean to “study authors, works, genres, and topics in African American literature from 1930 to the present,” particularly considering time and place, history, identities, and literary canons? And even more difficult, how might we consider the fields, formations, and possibilities of “African American Literature” through science fiction or speculative fiction? Sheree Thomas, editor of the 2000 collection Dark Matter: A Century of Speculative Fiction from the African Diaspora, said, “The science fiction and fantasy genres have always offered readers, bold, extraordinary ways by which to examine society. The results have often been visionary, with writers acting as unflinching voyeurs who deliver engaging, sometimes scathing critiques of our traditions, values, nightmares, and dreams.” This class, then, will explore the intersections of literature, genre, media, race, gender, sexuality, class, and technology. Texts may include W.E.B Du Bois, Pauline Hopkins, George Schuyler, Ralph Ellison, Samuel Delany, Octavia Butler, Toni Morrison, Derrick Bell, Jewelle Gomez, Nalo Hopkinson, Nisi Shawl, and Nnedi Okorafor. Jamaican Canadian writer Nalo Hopkinson wrote, “Science fiction and fantasy allow us to step outside our known reality and examine that reality from a different perspective. They do so by creating imaginary worlds as lenses through which we can view our world.” With this in mind, what might “world literature,” in this case broadly conceived through science and speculative fiction, reveal about us and the world we live in? What if the world around us is made up of multiple worlds? How do these worlds overlap, interact, and imagine different possibilities and realities? This class will take up these questions to explore and articulate the ways literature is in fact worldbuilding, worldmaking; we will explore the intersections of global literature, genre, media, race, gender, sexuality, ability, class, nation, and technology. Texts may include W.E.B. Du Bois, Karel Čapek, Jorge Luis Borges, Chinua Achebe, Gabriel García Márquez, Larissa Lai, Marjane Satrapi, Nalo Hopkinson, Nnedi Okorafor, and others. 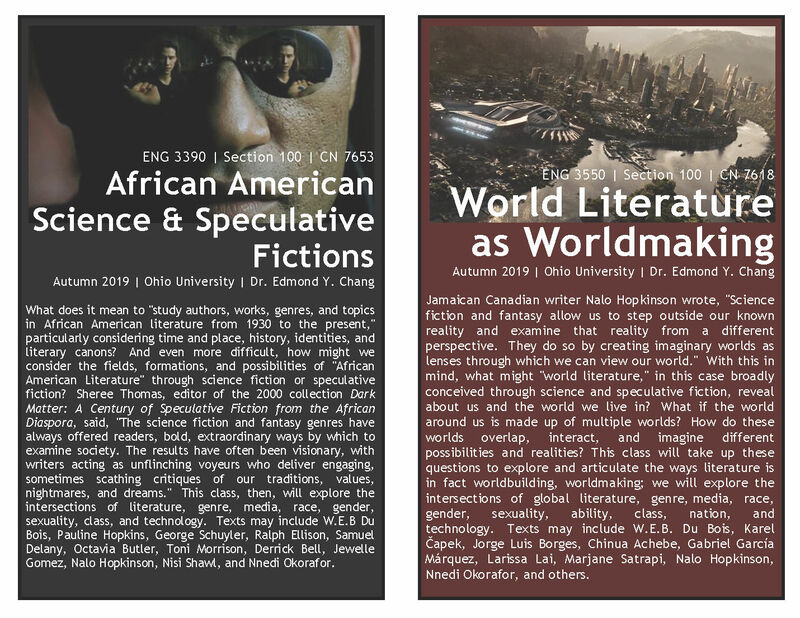 This entry was posted in #sixthyearfaculty, Courses, News, Teaching and tagged 3390, 3550, African American literature, African American science fiction, autumn 2019, Ohio University, World literature, worldmaking. Bookmark the permalink.